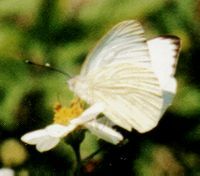 Great Southern Whites (Ascia monuste) are one of five white butterflies commonly found in Florida. They stay near the coasts, flying year-round in southern Florida and during the warmer months in the central and northern peninsula. Spanish needles, a weedy wildflower, is a favorite nectar plant as are lantanas and verbenas. The butterflies are often seen visiting the flowers in open areas on and near the beaches -- along roads and in parks, fields, and gardens. The adult butterflies have a wingspan of 1.75-2.25". Females may be dark gray in summer. The average lifespan of males is 5 days; of females, 8-10 days. Some Great Southern Whites migrate when temperatures are in the mid-70's (°F) or above. Typical migrations are 20-40 miles and last two days or less. Movement is usually northward in summer and southward in winter. Saltwort is the primary host plant in Florida. Mustards, particularly pepper grass, and capers may also be used. The eggs are pale yellow and are not harmed by salt water. The caterpillars are yellowish with dark greenish stripes.